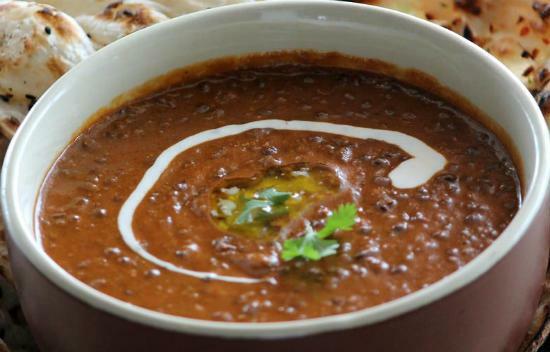 Dal Makhani is close to each and every Punjabi heart. Indian wedding is incomplete if Dal Makhani is not added up in buffet. Stealing the hearts of each and every Indian, Dal Makhani is at top in all restaurants’ Menu List. Every Punjabi restaurant, roadside eating place and food stall vendor knows that keeping Dal Makhani in its menu will fetch large amount of customers. Dal Makhani, also popularly known as maa di Dal in the Punjab, has a smooth velvety texture with lovely flavor which is an extreme delicacy of this heart stealing dish of the Punjab. Accurate mixtures and a little touch of love takes this dish close to perfection. Following recipe would help you to make a delicious finger licking Dal Makhani. Time required in preparation of Dal Makhani generally requires 8-10 hours because soaking of rajma and whole urad Dal takes time to soften up. Basic cooking time generally ranges between 31-40 minutes depending over the expertise of that person. Recipe given below generally is for 4-5 servings. This delicious recipe will give you mild taste in order to suit taste of different people. The people can easily make slight variations in the spices to give their own touch and adding their own flavors to it. This recipe is followed generally at homes and restaurants keeping it low on spice content and in order to smooth maximum percentage of customers. How to Make Dal Makhani? Step 1: First of all, rinse and soak sabut urad and rajma overnight in three cups of water. Step 2: In morning drain the water. Step 3: Sabut urad and rajma is to be boiled in three cups of water with salt as per taste and half the red chilli powder, if required add half the ginger too. Boil it till three whistles of pressure cooker. Open the lid to check if rajma is totally soft or not. If uncooked, boil them on low flame. Step 4: Butter and oil is needed to be heated in a pan. Add cumin seeds. When colors start changing, add ginger, garlic and onion and sauté it. Step 5: Add slit green chillies, tomatoes and sauté on high heat. Remaining red chilli powder and sauté are added till the tomatoes are reduced to a pulp in sauce form. Step 6: Cooked Dal and rajma are added along with the cooking liquor. Water can be added if the mixture is thick. Add garam masala powder and salt as per taste. Step 7: Simmer on low flame till the Dal and rajma softens up and well blend them. Step 8: Delicious Dal Makhani is ready. Serve hot. Some people love Dhaba Style Dal Makhani. Specialty of this Dal Makhani is that it gives it Indian touch and adds mild tandoori flavors to it. It is one of the most followed recipes in northern India where people love local dhaba flavors more than authenticated restaurant flavors. If you want to make dhaba style Dal Makhani, following steps are needed to be followed in addition to the above one. A small piece of charcoal is heated on flame till it becomes red hot. Pick up the burning charcoal with help of tongs and keep on turning the charcoal so that it evenly burns. Place this burning charcoal on an onion shell or a small bowl. Some oil is drizzled and you will see the charcoal leaving smoke. Place this onion shell (or the bowl) in the pressure cooker immediately and keep it covered for a minute with the lid. Open the lid. Remove the onion shell. Stir the Dal Makhani one last time. 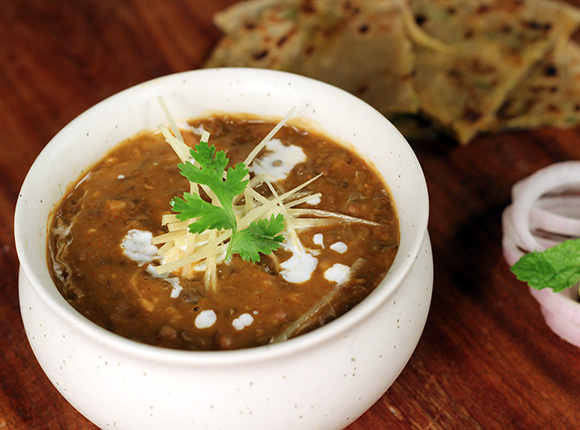 Dal Makhani can be served hot plain or topped with some butter or cream. Rotis or naan or paratha or tandoori rotis or plain rice or jeera rice or ghee rice or plain biryani is given with it to maintain its flavor. Dal Makhani is a very versatile dish that can be blended easily into different flavors. In Goa, black cardamom and clove is added up to Dal Makhani that gives it different flavors and a western blend. In north India, especially in dhabas’, garam masala is added in little high content to give it a spicy tough. When same Dal Makhani is prepared in home, it is made with little moderate spice touch Thereby, as Dal Makhani travels to different nook and corners of India; it easily blends in their local flavor that brings out best out of it.